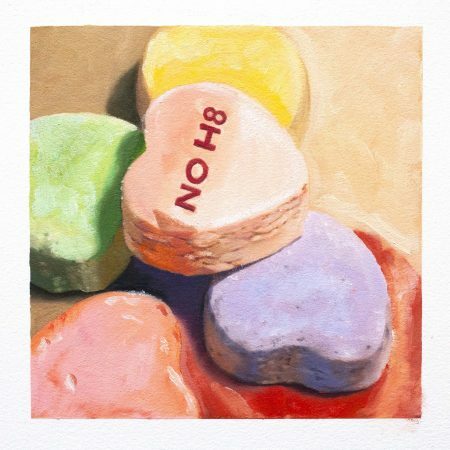 This NO H8 Valentine Candy Giclee on Paper by Andrea Alvin is a part of a special collection to celebrate diversity, inclusion, and tolerance. It also coincides with LGBT History Month in the UK, as well as a month in which Valentine's Day reminds everyone what is important, that truly, "Love is Love". 20% of the sale of limited editions from this series goes to The Trevor Project, which helps protect at-risk gay, lesbian, gay, bisexual, transgender, queer and questioning youth. Each limited edition (of 195) is signed and numbered by the artist. The original art is available HERE. Alvin graduated from the prestigious Art Center College of Design in Los Angeles CA, (now of Pasadena) in Advertising Design. 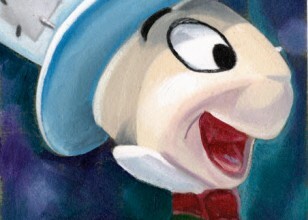 After graduation, she immediately began working as an animation layout artist and designer for commercial film production houses contributing creatively to many national and regional commercials and worked as a layout artist for Hanna Barbera. Alvin began painting and exhibiting her unique art in various galleries and venues throughout California. In 1989 she joined ranks with her husband, internationally renowned illustrator, John Alvin, creating their own design and illustration studio specializing in key art for movie posters. 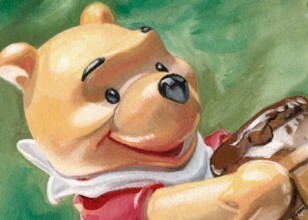 Andrea Alvin has contributed to the design and creation of ad campaigns for such movies as: Batman Returns and Batman Forever, Grumpier Old Men for Warner Bros., Pinocchio, The Hunchback of Notre Dame, Hercules, Mulan and The Little Mermaid for Disney Studios; Doc Hollywood and Jurassic Park for Universal.